The 26.82 metre motor yacht Vivierae has been sold with Glynn Smith at Denison Yacht Sales representing both buyer and seller. 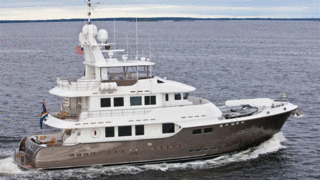 Designed by Jeff Leishman, she was built in GRP by the Taiwanese yard Nordhavn to ABS class as hull number one in the yard’s 86 series and delivered in 2008 with a refit in 2014. Décor throughout is in American cherry wood paneling with mahogany inserts and accommodation is for eight guests in four cabins consisting of a master suite, VIP suite, a double and a twin, all with entertainment centres, television screens and en-suite bathroom facilities. The main deck saloon has a convivial relaxation area in the lounge, with two comfortable settees to port and starboard facing coffee tables flanked by arm chairs, seating a total of 10 guests. Forward is a low cabinet concealing a hidden flatscreen television on a rise and fall mechanism — this cabinet acts as a divider between the lounge and dining room forward. Formal dining is offered for 10 guests in new upholstered chairs and there is an ice maker, sink, wine cooler and custom cabinets for all crockery, cutlery and glassware. Up in the skylounge lies a charcoal coloured L-shaped settee to port providing a great spot to watch a film on the flatscreen television, which rises from an aft cabinet at the touch of a button. The flybridge has no helm station but is instead dedicated to the al fresco enjoyment of guests, featuring a C-shaped settee and table to port, a drinks fridge and a large barbecue grill, plus a 52-inch television and a Jacuzzi tub, partially covered by the hard top. Twin 425hp Lugger engines give her a range of 4,000 nautical miles at her cruising speed of 10.5 knots.